The question of which trade policies are best for encouraging development in Least Developed Countries (LDC’s) is the subject of much debate. There are many examples where both free-trade principles and protectionist principles have been effective in developing nations. There is no cure-all policy which should be implemented in every nation, so to deal with the issue of international trade, we must have a dynamic approach. The principles of free-trade are essentially correct in the long-run. Developing nations have poor terms of trade in comparison to developed nations. Problems arise when trade is opened up without consideration of the possible consequences in the short-run. Some protectionist trade policies in developed nations have a (negative) impact on the development of LDCs. Better terms of trade can be an incentive for states in developing nations to focus their efforts on development issues and reform issues. Although there has been a strong trend towards free trade globally in the last several decades, protectionism and subsidization, particularly of agricultural industries, persists in developed nations which puts LDC’s at a significant disadvantage on the world market. Watkins tells us, “Each year, rich countries spend in excess of US$300 billion in support of agriculture—some six times the amount they allocate to foreign development assistance” (Watkins). The argument that this support is necessary to keep agriculture a viable industry in these nations is fundamentally flawed in two ways. First, if the support money is tracked to its final recipient, we found that 60 percent of farmers in the US “get no support at all,” and the biggest “7 percent account for 50 percent of government payouts” (Watkins). Second, if a farm in a developed nation cannot profit without subsidization, that is a reasonably strong argument that that farm should leave the industry for something more profitable. If the agricultural industry is sustained by subsidization, it indicates that the nation does not have a comparative advantage in agriculture, and the agricultural sector should be downsized and would be downsized under market principles. Efficiency in an economy is fostered by “creative destruction.” By artificially sustaining farms (especially in rich-nations), not only is efficiency reduced, but it puts LDC’s at an unfair disadvantage. This gets to the heart of the issue. Many developing nations have barriers to overcome before they can adequately trade on the global market (like poor connective infrastructure for example), but when one of these nations is prepared and willing to open up its borders for the benefits of trade, the trade climate, dominated by the wealthiest nations, is inhospitable. Additionally, the high level of support for agricultural industries by rich-nations results in surpluses that flood the markets of developing nations at undervalued prices. Watkins estimates that an end to agricultural subsidies in developed nations would result in a gain of US$40 Billion a year for developing nations. These gains come from increased exports and import substitution as products from developed nations lose their predatory advantage. A striking example of the negative effect rich-nations have on developing nations when they subsidize domestic agriculture is US cotton. 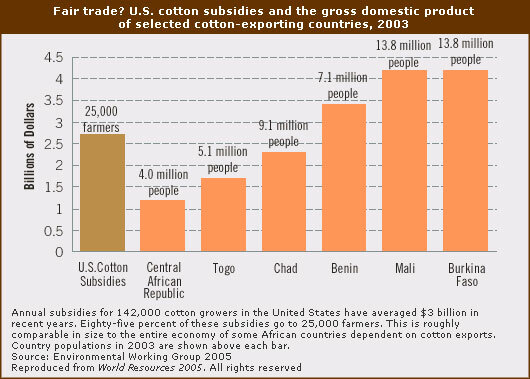 In 2001, the US subsidized cotton to the amount of US$3.4 billion. “According to the International Cotton Advisory Committee, these programs artificially lowered world prices by about one-quarter in 2001” (Watkins). The problem is that >10 million poor farmers in West Africa rely on exporting cotton as their main source of income and the governments in these countries raise a large portion of their revenue from export receipts of cotton (Watkins). If the US stopped subsidizing cotton, it is estimated that the incidence of poverty in Benin (for example) would fall by 4% (Watkins). The “solution” as we call it is relatively straightforward. Wealthy nations must agree to lower their domestic protections across the board and especially in key areas of the agriculture sector. Meanwhile, developing nations need to start removing what protectionism they have, but the conditions placed on these nations should be much more fluid. In recent history, many once impoverished nations sustained high levels of growth for decades or more. One important factor that these successful nations have in common is that they began trading in earnest with the rest of the world. China has sustained a high level of growth through expanding its export sector and to some extent limiting its imports through currency manipulation. While such policies might not be considered “fair” in an absolute sense, “fair” must be viewed from the perspective that many of the countries we are discussing are (or were initially) severely disadvantaged in the realm of global trade. There are many factors involved in sustainable economic development that are perhaps more important than trade, such as increased investment for example, but history has shown that economic growth is difficult if not impossible without a level of free-trade. Especially, “agricultural trade reform in rich countries is necessary to create an enabling environment in which pro-poor domestic reforms can work—and it is a condition for making globalization work for the poor” (Watkins). A positive example of how increased free-trade can promote growth in a developing nation is found in Uganda where better export prices on agricultural goods was credited with a significant reduction in poverty between 1992 and 2000 (Deininger). Another example is Vietnam where development was fueled by the growth in the rice exporting sector. This should be sufficient to establish free-trade and global trade reform as an important issue to tackle in approaching the problem of hunger. The next concern is how to go about freeing trade globally, considering both developed and LDC's. Currently the biggest forum for discussing free-trade issues is the WTO. While the WTO has been relatively successful in integrating the markets of developed nations, it has not been as successful in dealing with development issues. The Doha Development Round of the WTO has the stated goal of placing the needs of LDC's “at the heart” of the proceedings. This attempt has not been very successful. The problem is multi-faceted. First, developed nations, like the US and the EU, have very little short-term incentive to reduce protectionism. The solution to the first facet actually has to come from the political systems of developed nations. One of the problems with the Doha Round is that it has received very little media attention globally. The average citizen in the United States knows that the WTO exists but does not know that a “Development Round” is even happening (Shah). As a result there is little public pressure on the national government to act in the interest of global poverty reduction. Additionally, small but powerful (and more importantly loud) interest groups that have a vested interest in obstructing reforms that would benefit the globe have historically been relatively successful at curbing public opinion. A solution to this might be to adopt the same tactics that have been successful for those interest groups. Running advertisements and lobbying politicians is not an attractive solution, but it may be the best method to help the impoverished. Second, LDC's, by their nature, usually have very little to bring to the table when negotiating for Fair Trade Agreements (FTA’s) with developed nations. The Doha Round has had some success in reducing tariffs in various areas, but as developed nations have lowered tariffs, they have put in place non-tariff measures, and as subsidies have been cut, important recipients of subsidization have been exempted (Bouët). Not only do developed and developing nations need to agree to reduce protectionism, there needs to be a way of monitoring and enforcing what changes are made. The solution to this second facet is to give LDC’s more power within the organization of the WTO. If LDC’s had more power in the WTO, their interests would be better represented. To start, we must tackle how power is conveyed in the WTO. There is a voting system, but it is never used; rather the WTO functions by building consensus. This is a process that tends to be dominated by the interests of rich-nations (Watkins). Not only this, but when developed nations have agreed to reductions in protectionism, the measures they agree are upon are later watered down by exemptions and loopholes. To correct this problem, a regulatory council should be added to the WTO. This council would be tasked with monitoring the policies of the member nations. There are many ways developed nations can get around the decisions made at the WTO, so the regulatory council should monitor member nations to see that they are following the spirit and principle of WTO decisions. The council should be made up of a rotating list of fourteen member nations with geographical as well as development diversity. Specifically, there should be two members from each of the following geographical groups: Europe; East Asia and Southeast Asia; Northern Africa, West Asia, and South Asia; Sub-saharan Africa; South America; North America; and Australia and the Pacific Islands. There should also be an even division between developed and developing nations using US$4000 GNI per capita as the boundary between developed and developing in this context. The council should not function as a judiciary, but it should function in an administrative capacity to bring nations that violate the principles of development-focused free-trade to account for their actions in front of the WTO at large. This would give developing nations more control over their trade destiny while not excessively limiting the power of wealthy nations who do control much of the world’s economy. Especially, it would give developing nations more power in exactly the area where it needs more power. The implementation is by definition global. However, it may be useful to classify nations by how much they can benefit from trade. This would also go towards estimating the possible gains from this solution. In the case of the wealthy nations, the time-scale of reform must be short. The sooner Least-Developed Countries (LDC’s) are given fair treatment in the global market, the sooner they can begin developing. However, feasibility must also be considered. The elimination of farm subsidies in developed nations will have a significant short-term impact on agricultural communities. To combat this, a phased implementation is proposed which would allow farms to make improvements in efficiency or prepare to leave the market. A ten year plan should be long enough to mitigate some of the costs associated with “creative destruction” while be short enough to begin aiding developing nations quickly. A ten-percent reduction in protectionism and subsidization of agriculture in developed nations should occur in the first year. Then, every three years for the next nine years, a thirty-percent reduction (of the total value in 2011) should occur. In the case of the LDC’s the time-scale of reform needs to be more fluid. The potential for negative side-effects for LDC's in the short-run is even greater than in developed nations. The hope is that if each country is managing its own trade future, it will be able to couple policy shifts with other measures to mitigate transitional problems, frictional unemployment, price fluctuations,...etc. This just illustrates that global trade reform does not function as a solution in and of itself. It is an important co-factor for growth and development. To limit frictional problems, developing nations should be given a ten to fifteen year window in which to change their policies. The medium and long-term goal is to put LDC's on an equal trading field with developed nations. In the short-run the question of whether or not LDC's should be allowed to structure their trade policies in a way that gives them an advantage in absolute terms is another issue. If the global political climate is ever such that this would be feasible, it should be implemented. The advantages given to LDC's should be seen as compensation for their inherent disadvantage. However, it is highly unlikely that advantages for LDC's will be politically feasible in the near future. Regardless, in the long-run, as LDC's grow and become more on par with the rest of the world, their trade advantages should be reduced so that the benefits of comparative advantage can be fully realized on a global scale, and market imperfections as a result of artificially sustained trade industries are corrected. The implementation costs should be fairly trivial in terms of dollar amounts. One exception to this might be the aspect which deals with campaigning politically for global trade reform in developed nations. As a reference-point, advertisement spending on the health-care debate in the United States was in excess of US$100 million (Tracey).